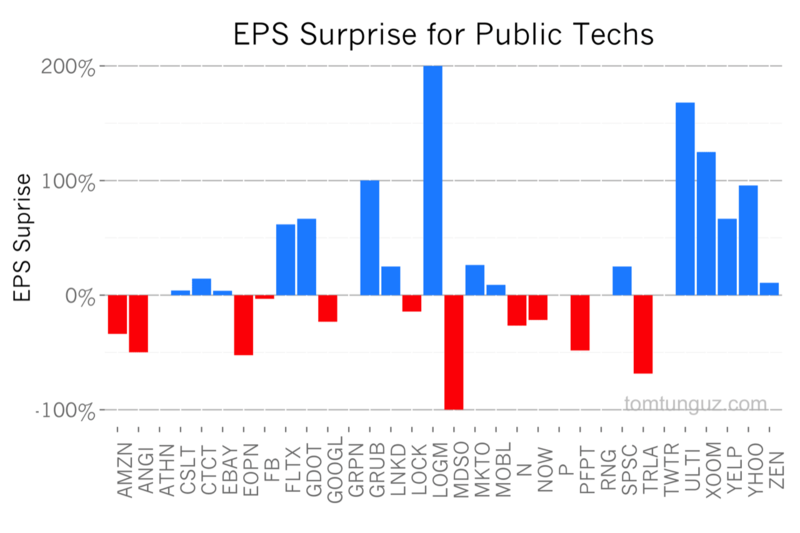 It’s Q3 earnings season and about half of the major public tech companies and recent startup IPOs have reported their figures. I keep track of earnings to get a sense for how these companies perceive their markets. Meeting or exceeding earnings indicates companies can forecast their growth and demonstrates how predictable these businesses are. The more predictable, the more stable the business environment and consequently, the fund raising environment for startups. 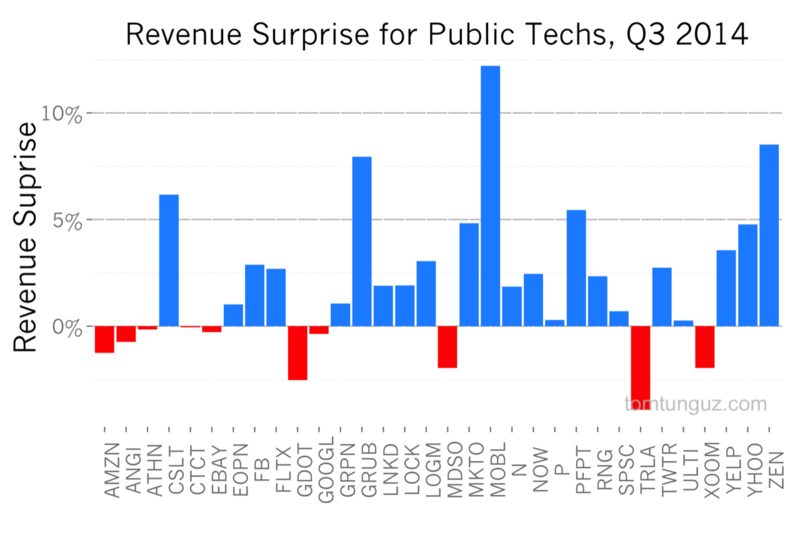 The chart above shows the revenue surprise figures for the companies who have reported earnings so far. Revenue surprise is the percent difference of actual revenue per share figures compared to the estimated ones prepared by analysts. 69% of these tech publics exceeded forecasts in Q3 which compares to 60% in Q2. Similar to last quarter, consumer companies constitute the majority of the revenue misses: Amazon, Angie’s List, eBay, GreenDot, Google, Trulia, Xoom. In fact, the median consumer company equaled revenue estimates, whereas enterprise companies surpassed them by 2%. But the difference is likely insignificant. Now to profits. 65% of these companies exceeded earnings. Interestingly, the enterprise company beat EPS estimates by 7%, compared to consumer companies who again matched estimates. Overall, high growth tech companies seem to be operating in very stable and predictable environments, a great sign for the tech and startup fundraising markets.